A frank and involving examination of addiction within the comfortable world of the North London middle class, with outstanding performances from Lisa Dillon and Kieran Bew. During a brief cat-sitting stay in Islington I’ve been making the most of the local theatre. Time only allowed for two shows, but they couldn’t have been more different, or surprising in the way that they contrasted – in content, setting and the demography of the audience. On Sunday I saw La Bohème, a low budget opera at a pub theatre on Upper Street. Tuesday night took me to the Almeida. Unlike may be supposed, the opera was filled with a mix of young and old of all classes, but The Knot of the Heart, a gritty tale of drug abuse and desperation, was viewed by what appeared to be an audience of entirely well-to-do Islingtonites. Fantastic to see that theatre of such variety and differing appeal can be playing within such a tiny radius. Both productions had a very strong sense of place. David Eldridge wrote The Knot with both the Almeida and lead actress Lisa Dillon in mind. The result is a play that is shocking and revelatory about the reality of addiction amongst the privileged, but also immediately relevant due to the proximity of its setting. It follows Dillon as Lucy, a children’s TV presenter, through three years dominated by heroin and a destructive codependency with her quietly alcoholic mother. Dillon is fantastic in combining the harsh reality of drug dependence with the childlike qualities that make Lucy at once human and pathetic. The part was conceived by Eldridge after a conversation with Dillon where she expressed a desire for a role that was ‘not defined by its relationship to a man,’ – he has come up with a truly fantastic realisation of that request. Lisa Dillon & Margot Leicester. Image from telegraph.co.uk. In fact, men are almost incidental to the plot. All of the male roles are played (with great skill) by Kieran Dew – as a variety of drug addicts, healthcare professionals and romantic interests. Lucy’s torment is entirely isolated from romance – not spurred by a break-up or heartbreak, but instead a very personal implosion brought on by ambition, rootlessness and a lack of any real responsibilities or established boundaries. The narrative is all the stronger for this, posing the difficult question for Lucy of what is to blame for her terrible situation. As an individual who has had every opportunity and connection, there is nobody that can be held responsible for her breakdown than herself and her ‘perfect’ family. The mother-daughter relationship is at the centre of this story, which channels into the modern dilemma of when parental ties need to be tempered for the good of both parties, and when it is right to be ‘cruel to be kind’. Eldridge’s fantastic script is not all doom and gloom however – the comedy of certain situations and Lucy’s humour shine through to provide welcome comic relief. Witnessing this very harrowing and real story is eye-opening without being taxing – a fine balance that is difficult to achieve but is demonstrated here with exceptional results. All of these elements are combined in a beautiful theatre – a real gem of the fringe. Complimented by a lively bar and a reasonably priced (£3) and informative programme (sponsored by Coutt’s as another indicator of the usual calibre of the clientele…) the Almeida have hit upon a winning formula. Extremely highly recommended. 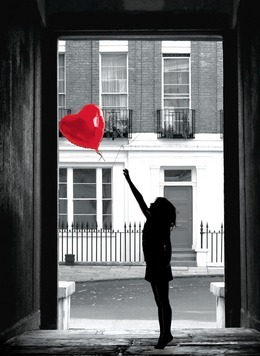 The Knot of the Heart is playing at the Almeida until Saturday night (April 30th).